Seoul is a city dotted with many mountains. 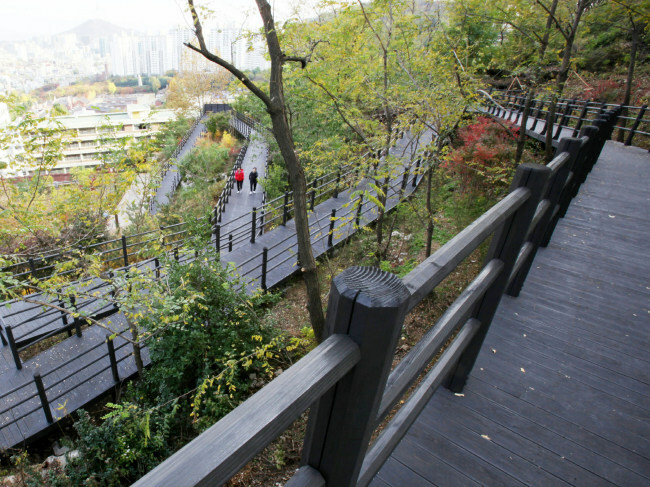 Following is a series that explores some of the easy trails in Seoul’s neighborhood mountains. --Ed. Ancient wisdom of Korea suggests that an area facing the waters with a mountain on its back is the perfect place to reside. As such, Seoul is surrounded by mountains and has the Han River running in front of its centuries-old capital region. 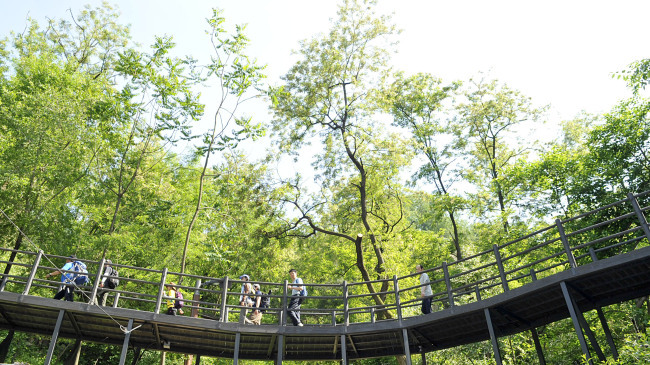 Mount Ansan’s Jarak-gil, located in the western part of the metropolis, provides easy-access to mother nature for city-dwellers. Jarak-gil refers to the mountainside roads located at the foot of mountains. Walking alongside them is comparable to somewhere between hiking and a stroll, as the slopes are not steep but offer some challenges for those looking for light exercise. Ansan Jarak-gil spans across several districts of Seoul, and extends to halfway up the 295-meter mountain. The most accessible entry point is the bus stop near Seodaemun-gu Public Health Center or Seodaemun-gu Office in Yeonhee-dong. Or one could access it via Dongnimmun Station (Line No. 3), Exit No. 5. One of the nearest parking areas is across the Hongjye-stream, which costs 20,000 won for all-day parking. 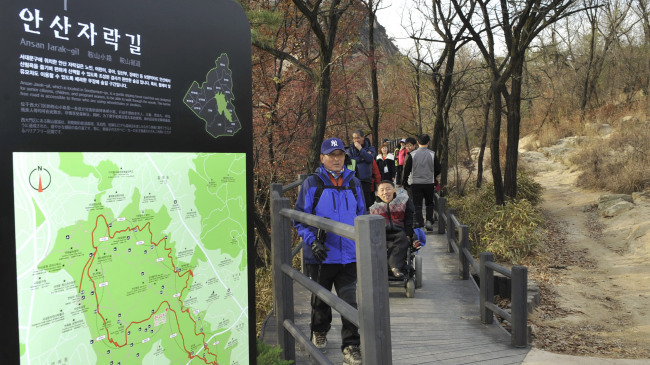 The trail spans across seven kilometers but there are several access points along the way, meaning visitors can decide to walk only parts of the trail. The whole trail takes about 150 minutes. Most of the trail consists of a wooden pathway, which park officials say allows visitors to easily carry wheelchairs or baby strollers. But one should note that while there are no steep slopes, the hike up the trail can be physically taxing for those visitors. Observatories stationed every now and then give a spectacular view of Seoul; you can spot landmarks like Gwanghwamun, Cheong Wa Dae, Han River and the 63 building on Yeouido glittering to the sunset. There are also seasonal events, such as Autumn Maple Road Walk that will take place this Saturday. The event kicks off at 8 p.m. behind Seodaemun-gu office and invites participants to enjoy the nature along the Jarak-gil. 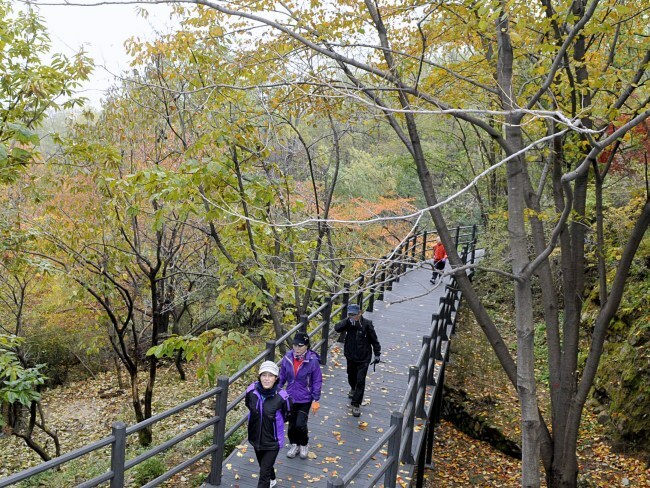 The trail transforms with seasons, as the Jarak-gil blushes scarlet with maple leaves in autumn and pink with cherry blossoms in spring. Among several attractions of the trail includes Cherry Blossom Library, which is not far off from the entrance point. It has benches, books and some shade for visitors. 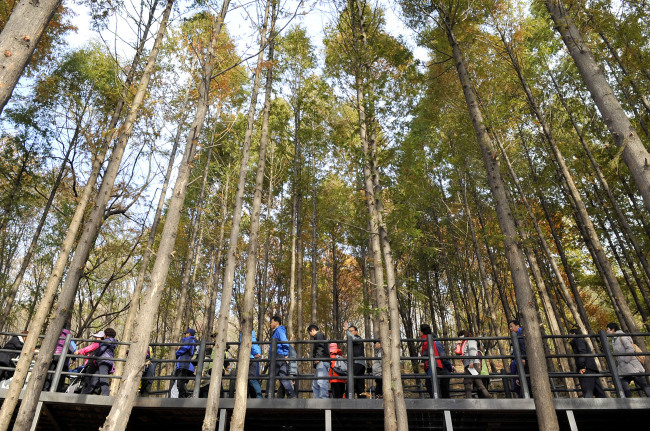 Along the way other surprises like the herb garden and Metasequoia trees reaching straight for the sky greet strollers. If you are looking for a quiet place to take a break, you can visit Bongwon-sa Temple. The historic landmark of Seodaemun Prison is also near the entrance point near Dongnimmun Station (Line No. 3).